Application Insights telemetry is a powerful tool for detecting, triaging, and diagnosing issues in your web services. The Developer Analytics Tools features in Visual Studio integrate Application Insights data into your editing and debugging workflows. Check out three of the latest features we’ve added. Web services are driven by requests. So, when you’re using telemetry to diagnose an issue in your web service, it’s helpful to see the telemetry in the context of the request that triggered the exception, dependency call, or custom event. 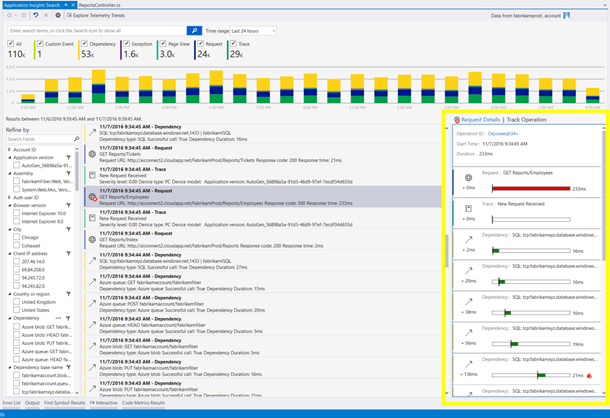 These sequences of related events are called “operations” in Application Insights. The new Track Operation tab on each event in the Application Insights Search tool shows other events that occurred during the same operation. The Track Operation tab makes it easy to piece together what happened in your service before a problem occurred by listing events chronologically. Timelines and event duration data for each event can help you spot slow dependencies and improve the performance of your service. The slowest event in each operation is marked with a flame icon to make it easy to find. Request telemetry for each of your ASP.NET controller methods is now shown in CodeLens. From the CodeLens indicator, you can see the number of requests in the last 24 hours along with the percentage of failed requests. By clicking the CodeLens indicator, you can also see the average response time for the request, plus comparisons between the last 24 hours and the prior 24 hours for each request metric. 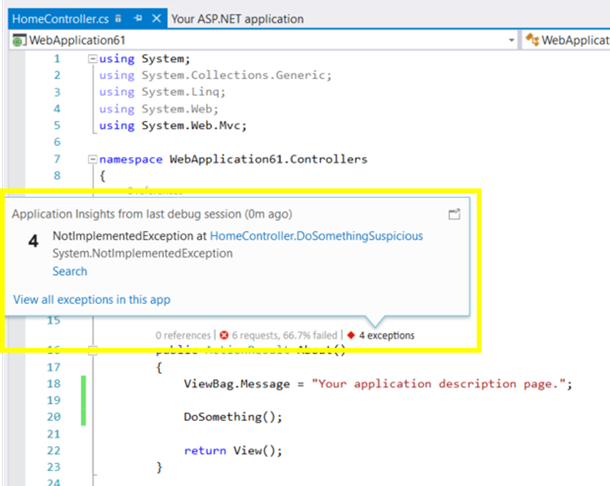 Learn more about Application Insights and CodeLens in the Azure documentation. CodeLens can now also show telemetry from local debug sessions, even if you haven’t connected your application to the Application Insights service in Azure. 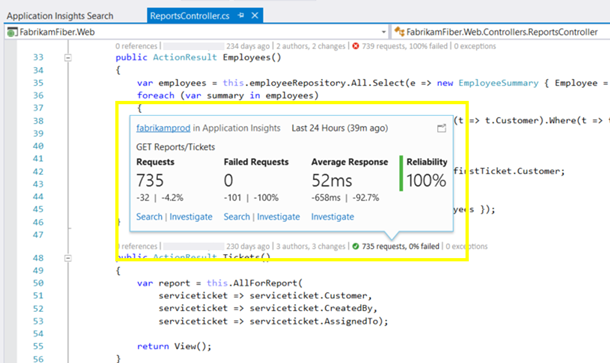 In ASP.NET projects with the Application Insights SDK, you’ll see CodeLens indicators for exception and request telemetry from the most recent debug session. When you stop debugging and edit your code, you’ll have request response times, exception data, and more at your fingertips. The Developer Analytics Tools features are included with Visual Studio 2015 and Visual Studio “15.” They’re also available as an extension on the Visual Studio Gallery. Follow the directions in the Application Insights Configuration window. Let us know in the comments below how you use the Developer Analytics Tools, and how else you’d like to use Application Insights telemetry from within Visual Studio.